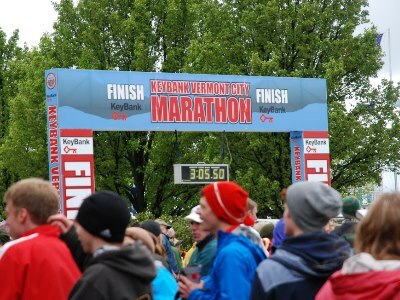 The 25th Anniversary KeyBank Vermont City Marathon was run on a miserably cold, windy and rainy Memorial Day Weekend. 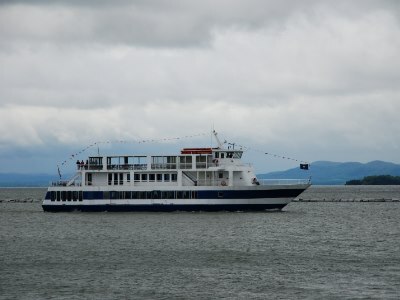 It loops in and out of downtown Burlington and along the shores of Lake Champlain. On a nice day, the Adirondack Mountains of New York State form a beautiful backdrop…but this was not a nice day! With 3,000 marathoners, 800 2-person relay teams, and 700 3-5 person relay teams, it’s a good size event, with lots of enthusiastic spectators. My trend of procrastinating continued, as I only left myself choices of late-spring marathons. A Memorial Day Sunday race in Vermont would give me a chance to find others to take a road-trip without missing work time. An added benefit was that we could stay at my mom’s place in the Catskill Mountains, since it’s directly enroute to Burlington. excitement of anticipating cars coming around bends. While visiting family at “The Farm” every 3-4 weeks, I get to run an 18 mile loop around a NYC reservoir that’s right down the hill from our place. It can be challenging, and there are no shortcuts to the finish. This definitely helps strengthen the legs, even though I don’t push for speed. In fact, I didn’t do any speedwork at all. My final 17 mile run was even more demanding as I ran part of Wilmington’s CR course up to Rockford Park, then back down to the Brandywine and up through Alapocas Woods and some of the Greenway Trail before descending to the Brandywine again to loop around and back up to where I started at Baynard Stadium. Dave McCorquodale joined me for the drive up PA Turnpike and through the Poconos, which is 4 hours door-to-door. But this time it would be six hours, thanks largely to being stopped dead (turned off the ignition) on PA Tpke Extention for over an hour due to an accident about 7 miles ahead of us! Still had to add the planned 30 minute lunch break at Mickey Dee’s. Rolled down the driveway at around 9pm, where Mom had some pumpkin soup and cake waiting for us. I couldn’t recruit anyone else from Wilmington to join us, so for the second leg of our journey north, Dave and I were joined by my 82-year old mother and my 13-year old niece Kaylin. Yes, I had carefully assembled a pretty impressive support team! We even switched vehicles from my 2-door Honda to Mom’s Subaru Forester. It had been raining for a couple days already and forecast still showed windy, rainy conditions through much of Sunday for our destination. This could be my “worste weather” ever, but I was overdue for it, so didn’t complain much. A pretty drive, even in the rain. 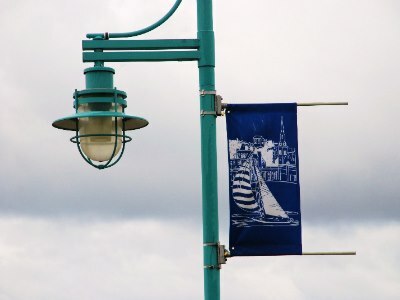 It was in the 40’s, with periodic heavy showers and bursts of wind. We stopped at a rest area near VT border and later did lunch at another McDonald’s, joking about the weather much of the time. Kaylin was basically with us for some quality time with her Grandma and me, but also to potentially visit a nice nature museum called the Echo Center in Burlington. Also, she could room with Mom and they could hang together while Dave and I ran the race. Pretty horse and cow farms in NY and Vermont kept the driving interesting and we were able to keep to my schedule of hitting the Expo on the way to “Handy’s Extended Stay Suites” in Winooski, under 3 miles from downtown Burlington. Crowded race expo was at a Sheraton with an even more crowded parking lot. Between the rain and a potential long walk for mom, we made good use of her handicapped card to find a primo spot right near side entrance! Grabbed bibs and shirts while providing the ladies their first taste of race atmosphere. Sticking to the schedule became more challenging with a diversion through a busy downtown area where we let Dave out to purchase a lap watch for the race. We circled the block, picked him up and checked into our rooms with just enough time for me and the ladies to drive a mile down the street to a local Catholic Church for Mass. Then we grabbed Dave and found a nearby Italian restaurant that I’d found online. Would have been perfect except for the hour wait in the rain, so we headed away from town, finding nothing until at the last minute “Jack and Grill” appeared, kinda in the middle of nowhere. But it turned out to be perfect since it was a nice place, had generous portions of pasta, and even large screen TV’s for us to catch some Rangers/Bruins playoff hockey! 5 block walk to the start, stationing Mom & Kaylin at a good corner, where they snapped our official “before” picture. Then Dave and I headed to the porta-potty line where I was shivering before long. Temp in the low 40’s with mainly mist or slight drizzle along with a diminished, but still chilly wind. Got to the corrals in ample time, and of course, it was warmer there, with bodies huddled more closely. I wore light gloves, figuring that whatever I wore would be wet and cold before long. 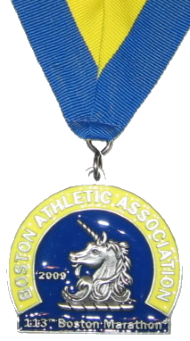 Since the Boston Marathon Bombing was still fresh in everyone’s minds, “Boston Strong” was one of the underlying themes for the event and we got to start the race to “Sweet Caroline”. As it turned out, I stayed just warm enough throughout the race to me not much more uncomfortable than usual, even though the entire morning was dark and dreary. Dave and the course map had prepared me for the rolling hills. We looped in and out of the downtown area a few times. My plan was to stick with the 3:30 pace group and shoot for my first-ever negative split. That didn’t happen. There were actually two 3:30 pacers and I stuck with the slower group for the first couple miles. With thousands of runners, many turns, and water tables that were far too short, I was unhappy with how narrow the course was, partly due to many sections of two-way runner traffice on city streets. Extra concentration was required to avoid tripping over legs or avoiding major puddles, because of the density of our group (yeah, I guess that could mean dense in the head also). I was impressed with the number of loudly cheering spectators! In the early miles, I spotted Tom Jermyn (up from Delaware to visit his daughter) encouraging the runners and yelled over to him. Besides missing water a couple times due to the inadequate tables, for a couple miles, we had to dodge small orange traffic cones. Theoretically for our protection from car traffic or sometimes runne traffic, they actually became their own hazard, so along with puddle jumping, fighting gusts of wind, and the many turns, there was an “obstacle course” kind of feel, which required more concentration (increasing mental fatigue). At the end of our first 5k loop, I found my personal cheering crew still stationed at their corner and gave them a shout and a wave. The next out and back section would bring us back downtown at mile 9. That was fun, since we could watch the faster (and later slower) runners on the other side to keep our minds off our own troubles. wind. It looked like a gale on stormy seas! Mile 15 brought us the longest hill of the day, back in town. 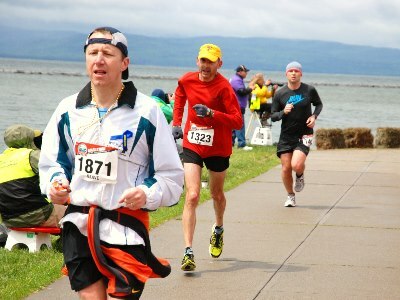 I plowed through, hanging on to the end of the pace group. Then it was out to suburbia again, along with one very muddy 50 yard stretch through a small park. Glad I wasn’t wearing bright, shiney new shoes. Around mile 19, I hear my name called and turn to see Tom Jermyn driving alongside me in his car, asking how I felt. It made me feel like an elite runner with his on-course support crew. He offered me a dry shirt (but not a ride). The slower 3:30 group dopped me around mile 21 and I started fearing that I could end up as slow as 3:40. This became my minimum goal, with 3:35 my reasonably optimistic goal. Several of the milemarkers had been blown down by the wind. 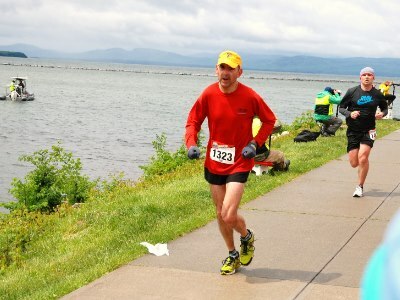 One of my saddest experiences as a runner came just after I passed a blown-down mile 23 marker. Just as I became pumped up with the idea of just 5K to go, a woman who I was overtaking asked me, “Was that mile 25?”. I’m pretty sure she was serious, so I felt real bad, telling her that it was 23. As all marathoners know, your mind isn’t always working very well in those late miles, so it’s easy to forget which marker you just passed and start hoping that you missed one (or 2 in her case). Mile 25 is typically one of the best sights ever. Gonna make it. No issues other than really stiff legs. We came alongside our favorite lake for the final gusts of wind (and even a peep of sunshine, unless that was my mind playing tricks). Big crowds for the last half mile and then the final tenth of a mile is a surprise grass finish – which would be fine if it hadn’t rained over 5 inches over the past couple days. So not the speediest kick to the finish, but I was content with 3:33 and happily gulped down a chocolate milk and grabbed a banana. I quickly found Mom & Kaylin and then Lee & Pat tracked us down. All had seen my home stretch and Lee took a bunch of pictures while I apologised to the ladies for exposing them to the nasty weather conditions for several hours. 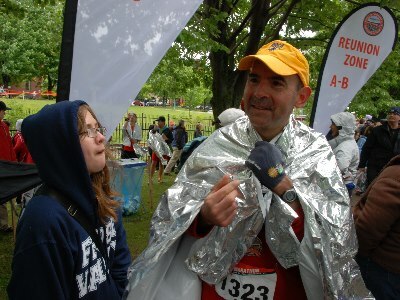 I was still chilly, and replaced the finisher foil blanket with the jacket that Kaylin had been carrying for me along with my phone and camera. Then, (the horrible son and uncle that I am) I snuck away to grab a few sips of beer in a crowded tent and hit the runner food area for pizza, yogurt, juice & chips. At least I shared the big bag of chips with my team! 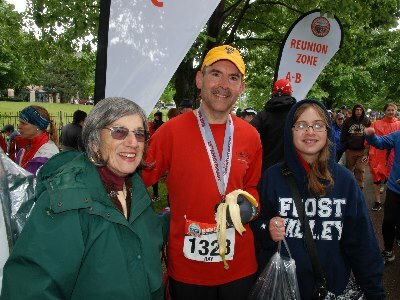 race recap) We took the long, slow walk back to the car as another brief shower fell on us. Nice to enjoy warmth again. Now it was time to eat, since Dave had passed on the long line for food down at Waterfront Park. Just a mile out of town, we found a Denny’s. I changed my shoes outside, then changed other clothes inside. No time for shower (and not much need either). Food tasted great and Dave found out the the Denny’s manager had taken in a Kenyan elite runner who knocked on house door around mile 20 since he’d had enough of the nasty, cold conditions! On the way out of the area, I decided we’d stop at Magic Hat Brewery, since I’d seen the sign on the way into town. Mom got a sample and Dave bought a six-pack. He drank a couple as we headed down the road. That cheered him up! Two rest area stops on the way down kept our legs from tightening excessively and between leaving Burlington and driving past Kingston in the early evening, temperature went from 50 to the low 70’s with few clouds in the sky! Arrived at The Farm and enjoyed a pasta dinner. 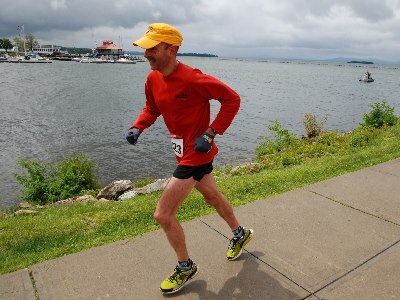 Besides running, Lee Kauffman spends lots of time climbing mountains, in particular the Adirondacks. 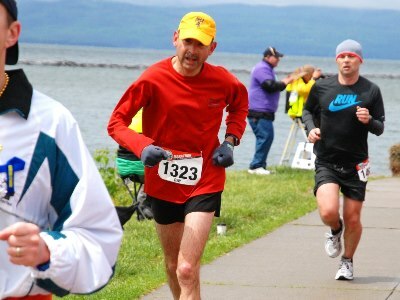 When he found a 2 man relay team who needed a last minute-replacement runner, he jumped on it and ran the first leg for a Ben & Jerry’s team. Then he grabbed his camera to take photos as Dave & I finished. Since he was snapping elite runners anyway, he took a couple of the great Bill Rodgers, who was doing the final leg for a relay team. It was super to share our experience with other Delaware runners!